The $3.5 million Blackwood roundabout upgrade will improve traffic efficiency and safety as well as pedestrian access through the high traffic area. Following the project announcement in June 2017, the department began consultation with the community and stakeholders in the Blackwood area and sought feedback from the wider community on the concept design. Earlier last year the City of Mitcham undertook further consultation on the relocation of the Blackwood War Memorial Soldiers’ statue, and on 24 April 2018, Council endorsed its relocation in front of the Uniting Church. Lane utilisation use will remain the same for all approaches with the exception being the Shepherds Hill Road approach. Both lanes will now be able to go through the roundabout to Main Road towards the rail crossing. Please click here for a copy of the latest lane utilisation plan. Main construction works scheduled to start mid-February for completion by ANZAC Day, 25 April 2019. To minimise impacts to road users and pedestrians, construction work will be undertaken as a combination of day and night works. Night works are planned to commence in mid-February and will be undertaken from 6pm-7am weekdays. Final landscaping for the project will be undertaken in the second quarter of 2019. A Traffic Liaison Group has been established to oversee traffic planning for this project and includes key representatives from the City of Mitcham Council and emergency services. Impacts to surrounding properties and road users due to construction works will be minimised where possible throughout the duration of the works. Works will be occurring on the footpath and there will be some changes to pedestrian access throughout the construction period. Traffic management signage will be in place to direct road users. All are advised to follow the direction of traffic management staff and observe the safety signage. 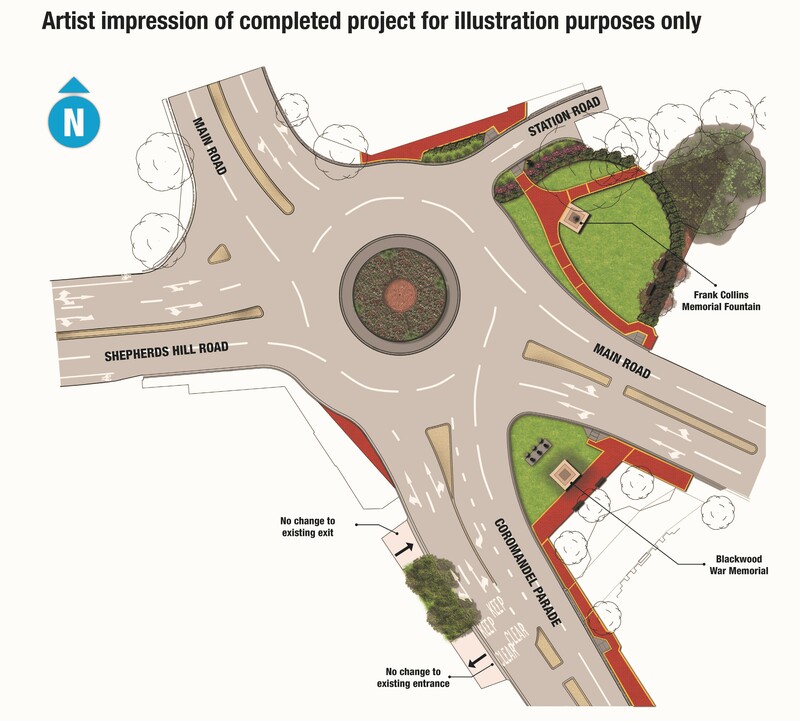 As part of the roundabout upgrade, the Blackwood War Memorial and Frank Collins Memorial Fountain require relocation as shown on the concept plan. Both memorials will be in place prior to ANZAC Day commemorations. To register to receive project information and updates, complete the online feedback form and check the Latest News & Publications page regularly.